Australian Prime Minister Kevin Rudd has visited The Queen at Windsor Castle. He met The Queen in the White Drawing Room, part of the suite of Private Apartments where The Queen lives when at Windsor Castle. 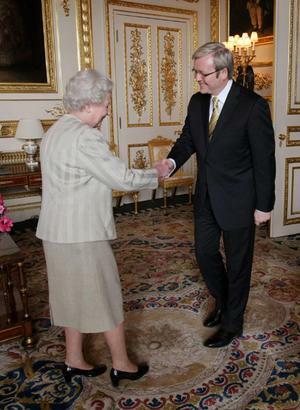 But the news story was not about Rudd meeting The Queen, it was about the fact that he did not bow when meeting her. Although it is not required, it is deemed respectful to bow your head when you meet a member of the Royal Family. Australia has been considering becoming a Republic for some period of time, but a referendum held in 1999 retained the monarchy. Unlike previous Prime Minister John Howard, Kevin Rudd is a republican. It is inevitable that at some stage the issue will be debated in Australia again, but some people feel that the issue should be delayed until after The Queen’s death. To learn more about the White Drawing Room you can purchase the Virtual Tour of Windsor Castle.